When mom and dad are forced to go help grandmother after her car breaks down, Rosy, her dog Rufus and her siblings are left alone to care for one another. Soon boredom sets in, so Rosy suggests that they all go on a bear hunt. Follow along as they explore different elements, nature's creatures and a big surprise! This DVD is based on the popular kids book. 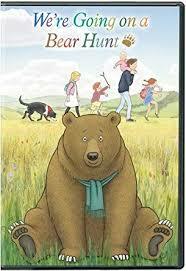 It is beautifully illustrated and perfect for the entire family to enjoy together. This makes a great stocking stuffer, or holiday gift. story of perseverance, optimism, and love of nature. It looks like a sweet story for young kids. The book itself looks really nicely illustrated, too.